A few definite steps allow to fully recognise the nature of the Events. Also, the action and function of the devices part of the industrial Machinery and of the equipments to count and relate them. For example Triggers, Microprocessors, PLCs, etc. As an initial step, it is necessary to understand that the 4D space-time described by Minkowski and Einstein between 1905 and 1907, still presented as a basic concept to the future Electronics or Electrotechnics Engineers, since several decades is no more witheld a theory representing the idea of reality outlined by the experiments. A key point regards Time. Time has been in the past considered to be the fundamental phenomena underlying Dynamics. Until 1907 the 3D spatial environment was considered stratified by the universally valid time coordinate t.
The relativistic point of view about Time and Events conceived in 1907 a 3D flat space labelled by mean of the Time parameter t. Time continued to allow to order sequentially all the physical Events, as an example, the measures of a Physical property like the spin or its collective counterpart, polarisation. Events identified with 3+1 coordinates. Still a single-history concept, where a bulk of flat 3D spatial hypersurfaces is crossed by one perpendicular time-like straight line and definite corrections have to be applied to times and distances to account for the relative speedths of the moving bodies. Single-history concept of 1908 by the laymen still today imagined the environment we are inhabiting. In 1915, Einstein in its General Relativity revised deeply Minkowski's idea of 1907, applying new principles (general covariance and equivalence) over topological spaces. Since then, Time has no more the unambigously defined meaning of Event-identifier it had before. The topological spaces to whom we are referring are the Manifolds, resembling near each one point the known Euclidean space. The neighbourhood of each point of an N-dimensional manifold is homeomorphic to the Euclidean space of dimension N. The simplest 1D manifolds are the curves and the circles, and the 2D manifolds are named surfaces (i.e., plane, sphere). Relativity conceives whatever, thus including we, our devices and machinery be living in a higher dimensional differentiable Manifold M.
comparing different perturbations, they are never visible completely identical outcomes. Going deeper to the rationale of all Triggers, these are the devices to label with different Information different leaves of the foliation M. Thus, allowing us to eliminate an ambiguity whose nature is cleared by General Relativity. Here, to every point of a differentiable manifold can be attached a tangent space, say a vector space containing all possible directions along which one can pass through the point. The ambiguity derives by the fact that an infinity of time-like curves γu with tangent vector, can be identified as world-line of an object. If the parameter t on γ is such as to make the tangent vector unitary, then its physical meaning is that of the proper time t of an object. A well known example in the infinite identical meridian lines, joining South and North pole of the manifold named Earth. In this case, ambiguity eliminated by labelling all meridians starting by one conventionally chosen as global reference. An extremal example of the basic problem in the figure above. 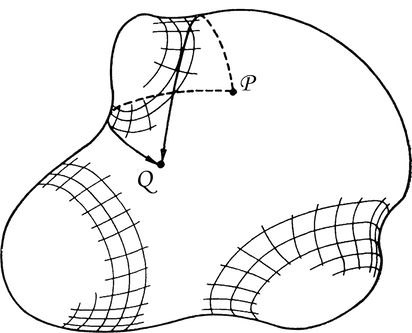 Here, in the particularly curved surface of a manifold, two different equally reasonable geodesics joins the points P and Q . Visibly, two different fully equivalent time-like world-lines can be followed to go from a point to the other. An additional example considering the ramp of an airport, itself actually a portion of a differentiable manifold. Infinite trajectories are allowed to planes for landing or take-off. But, we know that some of them are more probable than others. What are the trajectory and kinematic of the plane ? … all of them are possible, but only some of them are persistent constructive superpositions. Trying to figure out the kinematical properties of a container on a Conveyor or into a rotary Machine, the pulsed Radar spotting a single plane at time intervals, is replaced by the triad Clock-Encoder-Trigger. Thus making it possible to infer the containers’ kinematics in all Electronic Inspectors and in the Rotary Machines like Fillers, Labellers or Blowformers. The interferential behaviour of the liquids mimics that experienced by all material particles, as demonstrated in 1927 by the great French physicist Louis de Broglie. Also quantum particles (for example, electrons and other quarks) composing all material bodies, overlap one another. Thus causing wavelike patterns unexpected from a macroscopic point of view. It is this characteristic of the matter which is being used in the quantum computation applications to obtain massive parallelism. Interference when reading off a new result mathematically related to multiple intermediate results of computation, without revealing what any of them are. Opposite than what some imagine, it is not the phenomenon named Entanglement the cause for the massive parallelism, rather merely interference. Like in the liquids in the figures above, Interference allows different realities to overlap, summing up destructive and constructive effects. Interference of what ? Of different branches of the differentiable manifold foliation M, say of distinct portions of the Multiverse. S(G) and S’(G) are the Hamilton-Jacobi dynamical phases due to different waves. Their elliptic intersection points, magnified by the lens, regions of constructive interference. What the figure before is showing is a dynamical geometric object (geometro-dynamics is a synonimous of general relativistic), describing the dynamics of the 3D spatial geometry. Namely, a propagation of the intrinsic curvature on space-like hypersurfaces with respect to a time coordinate t that labels a foliation of the spacetime. Spacetime dynamically arising by the succession of leaves. a speed of ‘speed of time’ is a tautology. Waves and manifolds are commonly associated. This also at the macroscopic scale of our industrial Machinery, equipments, inspection and detection devices. A full understanding of this last decisive concept is visually aided by the figure here at left side. Here, two gaussian wave pulses with a minimal amplitude difference, are travelling on a nondispersive string in opposite directions. Visibly, they pass through each other and superimpose without any reciprocal disturbance. when the gating system of the measurement instrument (Trigger, detector or a complete electronic inspector) lies in one of those time intervals (the inspection window) allowing further processing. space, ...is a 3-dimensional geometry, a single point in the hyperspace S.
Signalling, in the detectors and equipments part of the industrial Machinery is frequently electromagnetic. The most modern design address is toward the transition to fiber optic signalling between all equipments. Another widespread classic idea needing to be updated to the experimental reality known in the Third Millennium, regards the signalling. The public idea assumes that signalling is happening in a common 3D space: transmitter and receiver should be exchanging informations carried by energy moving through the 3D space the laymen think to be inhabiting. But, an arbitrary metric space A is defined to be positive definite if each of its finite subsets is positive definite with their induced metrics. 3-dimensional spaces have positive definite metric, what implies that physical effects cannot propagate from one point of the 3D geometry to another. Why ? Because a physical quantity local to a point, and another local to another point, have no reciprocal coupling: they commute. The meaning of the sentence above in bold characters has far reaching consequences. It implies that also the appearances of material objects, a macroscopic case of the measurements (and, triggerings) of the Electronic Inspectors and Industrial Machinery, are exclusively happening between different 3-geometries where we, our electronic inspection devices and Machinery are existing. The first clear idea of this by Minkowski, dated 1908, was valid only for the flat, idea Euclidean spaces. In 1967, these concepts were carried further by J. A. Wheeler, then the greatest living relativist. He was capable to establish a firm bridge between the two most successful physical theories, General Relativity and Quantum Mechanics. In other sections and until now, we spoke about the spacetime, looking at its topological properties. That is not all of the story and there is an additional property to consider: the spin. There is a criteria to identify a topologic variety as a candidate to be the master plan of the physical space where they happen binary classifications based on measurements. The same effects we observe on macroscopic objects or that we can logically infer, have to be autonomously rendered by that topology. Imagine a cube. Attached, like in the figure below, to four of its corners four elasting strings. present the handles which let them be identified as wormholes. In a multiply connected space they have to be expected behaviours looking strange as seen from our many-3-geometries-at-once point of view. Imagine two identically coloured pink cubes. Also, oriented the same way with respect to a single triad. Let one of them enter the wormhole by one of its throats. Let the other cube move along the flat surface out of the handle, from the same throat where the other get in, til the other throat. You’ll discover they'll get rejoin themselves differently oriented with respect to the triad used as a reference when they get in ! This kind of geometric structures are an unavoidable feature of the space. As a matter of fact, surfaces like the one visible here at left side, whose circumference seen from the external (upper) side is much smaller than their radius, are really present at the small scales. The Readers may immediately consider the risk to introduce Closed Timelike Curves (CTCs) in the structure of the space. These risks really exist applying the General Relativity theory without the conditioning of the modern version of the Principle of Superposition, of quantomechanical origin, object of deeper analysis in other sections. CTCs are constantly created, but on timescales extremely small (~10-43 s), giving effects completely uneligible in our macroscopic measurements. The synthetic and technological meaning of what preceded is that General Relativity, a theory made of worldpoints named Events, constitutes a device to calculate and constructing a leaf of history that slices through the higher dimensional space S whose dimensionality is ≥4. What above has relation with the purpose of the Triggers adopted in the industrial automated Quality Control (electronic inspection) and in the Machinery. Knowingly, the purpose is to acquire Information about the phase, state, dynamic or kinematic conditions of an object. is the necessary and sufficient precondition to let a microprocessor have information about the presence of objects and their kinematic, is a basic notion. But what is the rationale for that necessity to “acquire Information” ? The reason is that the Triggers, are a way to differentiate leaves otherwise undistinguishable. There is always at least one Trigger introducing objects into the Shifting-Registers. Shifting-Registers clocked (Time-related) and counting the Encoder pulses. The figure above shows portion of the multiply connected manifold seen in the figure immediately before. It is a bi-dimensional representation limited to the leaves A, B, C, D+ and D_ in a representation privileging Time evolution. Here, ΨE (x, t) is a probability amplitude function, E is the Energy and x a spatial coordinate. What it is showing is a different way to visualise coexistence and separate evolution of several different 3D spaces. In red colour we highlighted areas of interference. All interferential phenomena are those where what is observed depends on what has been happening in more than one Universe. Looks too complex ? Not that much, when thinking that Nature adopts similar designs also at our macroscopic scales. Below, an example of botanical branchings. The cuts reveal the inner foliated structure: a geometric dynamical reality referred to a foliated 3D space which, having existence extended along the Time-dimension, is a 4D space foliated with 3D spaces. But, yet in 1967 it was suggested that the space-time of 1915 does not exist. On the opposite, it is just one of the ways we perceive the fundamental Quantum Field. The idea received contributions by many, some of them nobelists. Between them Paul Dirac, Higgs, Bergmann, Pirani, Arnowitt, Deser, Bryce DeWitt, Charles Misner and John Archibald Wheeler. “We, and our Detectors, occupy a multitude of 3D leaves along a single constructive interference crest. It is known that the nature of Time and its very existence are since thousands of years object of innumerable philosophical discussions. Yet 1-2 centuries ago mathematicians and physicists as Leibniz and Ernst Mach debated against the then dominating idea of absolute Time. Until recently, the evidences against the idea of Time as a fundamental of Physics, were only philosophical or logic. In 2013 the concept of Time had been experimentally proved derived, rather than fundamental. Time reduced to just an apparent effect of that particular kind of relation named Entanglement of a multitude of individual measurements happenings between different 3D spaces, foliated to form a 4D. We, and our Detectors, occupy a multitude of these 3D leaves along a single constructive interference crest. And that’s why we feel the effect of Time named Dynamics. In this way, spatial geometry itself becomes a physical clock, and the program of Leibniz and Mach may finally be fully taken into account by completely eliminating any relic of absolute time.